Photo by kind permission of Nigel Bovey. The Comet Trio is the ultimate all rounder, designed by Phil Morison to be ideal for racing, cruising and training. A dinghy as versatile as this is often full of compromises, but the Comet Trio rewrites the rule book. The classic hull lines don’t just look good, they provide the Trio with the sort of performance that often seriously embarrasses supposedly faster racing dinghies. Great fun. The Trio has to be the most comfortable racer ever, with a low cockpit floor and high boom for easy tacking and gybing, The optional asymmetric spinnaker is really easy to use even if you have not used a spinnaker before. When first introduced the Trio had spinnaker bags, however you now have the option of a chute, something that may Trio owners are switching over to. The hull lines are fair and balanced with an elegant bow and fine entry giving excellent performance at sea or inland. There is plenty of sail area for amazing light wind speed and easy planning in stronger winds, but is easily reefed for beginners or heavy weather. The Trio has an incredibly roomy cockpit that easily accommodates a large family with all round “sit in” seats providing security for the young and inexperienced. There are two mainsails available; A Dacron cross cut with slab reefing and a radial cut laminate sail without reefing. The Dacron furling jib quickly reduce the sail area so even beginners feel confident and in control. The Trio is truly versatile, with options of front or rear lockers, outboard motors and even oars making this dinghy a great all rounder. 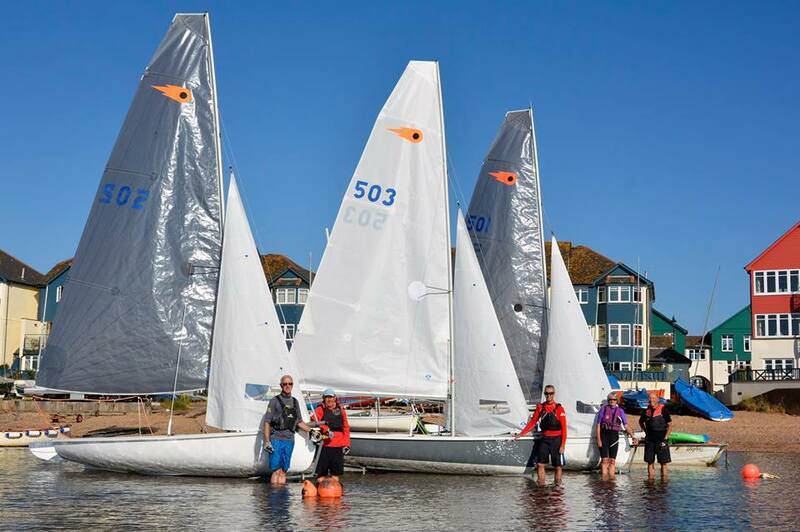 Many Trios are hard at work at sailing schools or used as training dinghies at sailing clubs. Roomy and steady enough to carry 4 or 5 students but potentially fast and responsive for one to one tuition at higher levels. All mouldings, spars and fittings are tough and durable to give years of trouble free service. Race, cruise, teach, Sail, motor or row: it’s your choice. The standard Trio is well equipped, but by choosing various options, your Trio becomes bespoke, tailored to your needs and desires. We offer you that important personal service and are more than happy to arrange a demonstration sail. Built in GRP with Coremat for stiffness without excessive weight. Available in a wide range of colours. We have introduced a new tapered mast and a stiffer boom, both made exclusively for the Trio by Selden. This new rig also incorporates a jib tensioner, making this task much easier for novice and expert alike. Along with the new spars we have also introduced a new suit of sail made exclusively for the Trio by North Sails. There is a Dacron main with slab reefing. Furling jib with large window. Aluminium rudder stock and tiller, telescopic tiller extension and uphaul/downhaul system. Made from glass fibre with a foam core. Rudder Blade is semi balanced for light responsive steering. Aluminium keelband , jib sheet jammers, self bailers, centreboard slot gasket. Rear mainsheet with auto ratchet block. 4 – 1 kicking strap. 4 – 1 cunningham and outhaul. Telescopic Bowsprit, Radial cut Spinnaker in a variety of colours, Spinnaker Chute and stowage bag. Auto-Ratchet blocks for sheets. All blocks are ball bearing with a mainsheet swivel jammer and a ratchet block on the centreboard case. Fairlead and jammer on an aluminium track for quick adjustment of sheeting angle. Helps find optimum sail shape. Helps make quick sail adjustments when racing. Powerful cascade 16:1 kicker, downhaul and outhaul led aft to camcleats on centre seat. Ropes are dyneema with ball bearing blocks. Lightweight aluminium and plastic, clips under side seat. Roomy dry locker with large hatch for easy access when sailing. Note - We only supply the new rig, designated as the Mk II. Mk I info is included here for comparison only.